Get in touch with nature at Beechwood Farms Nature Reserve and Mount Washington. Get some cultural insight at Bicycle Heaven and Cathedral of Learning. And it doesn't end there: steep yourself in history at Phipps Conservatory and Botanical Gardens, get a new perspective on nature at Carnegie Museum of Natural History, take a stroll through The Strip District, and admire the masterpieces at Carnegie Museum of Art. For photos, traveler tips, ratings, and tourist information, go to the Pittsburgh online itinerary planner . If you are flying in from United Kingdom, the closest major airports are Pittsburgh International Airport, Erie International Tom Ridge Field and Cleveland Hopkins International Airport. In February, daytime highs in Pittsburgh are 5°C, while nighttime lows are -5°C. Wrap up your sightseeing on the 11th (Tue) to allow time to drive to Cleveland. Here are some ideas for day two: examine the collection at Rock & Roll Hall of Fame, browse the eclectic array of goods at West Side Market, stop by Campbells Popcorn Shop, then take in the architecture and atmosphere at St John's Cathedral, and finally try to win big at JACK Cleveland Casino. For other places to visit, ratings, and tourist information, use the Cleveland holiday builder website . You can drive from Pittsburgh to Cleveland in 2.5 hours. Other options are to take a train; or take a bus. Expect a daytime high around 2°C in February, and nighttime lows around -6°C. 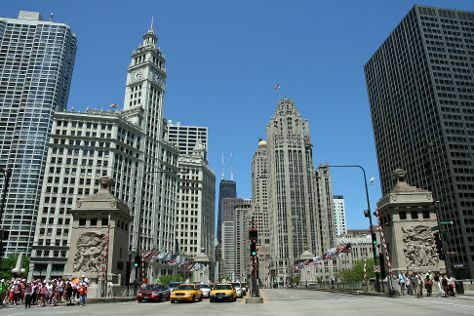 Wrap up your sightseeing on the 13th (Thu) to allow time to travel to Chicago. Kick off your visit on the 14th (Fri): explore the world behind art at The Art Institute of Chicago, then explore and take pictures at Millennium Park, then take a stroll through The Magnificent Mile, and finally browse the exhibits of Chicago Cultural Center. On the 15th (Sat), you'll have a packed day of sightseeing: take in the spiritual surroundings of Fourth Presbyterian Church and then meet the residents at Lincoln Park Zoo. For photos, ratings, other places to visit, and tourist information, use the Chicago online travel route builder . Getting from Cleveland to Chicago by flight takes about 3.5 hours. Other options: do a combination of flight, bus, and subway; or drive. The time zone changes from Eastern Standard Time (EST) to Central Standard Time (CST), which is usually a -1 hour difference. In February, plan for daily highs up to 2°C, and evening lows to -7°C. Wrap up your sightseeing by early afternoon on the 15th (Sat) to allow enough time to drive to Indianapolis. Start off your visit on the 16th (Sun): try your luck at Harrah's Hoosier Park Racing & Casino, then stroll through Indianapolis Zoo, and then learn about winemaking at Oliver Winery. On your second day here, explore and take pictures at Indianapolis Museum of Art and then look for all kinds of wild species at Exotic Feline Rescue Center. To find where to stay, maps, traveler tips, and more tourist information, you can read our Indianapolis vacation planning app . Traveling by car from Chicago to Indianapolis takes 3.5 hours. Alternatively, you can fly; or take a bus. Traveling from Chicago to Indianapolis, you'll lose 1 hour due to the time zone difference. Expect a daytime high around 5°C in February, and nighttime lows around -6°C. Wrap up your sightseeing by early afternoon on the 18th (Tue) to allow time for the car ride to Louisville. Kick off your visit on the 18th (Tue): explore the fascinating underground world of Louisville Mega Cavern. Keep things going the next day: examine the collection at Louisville Slugger Museum & Factory, explore the world behind art at 21c Museum Hotel, then contemplate the long history of Conrad-Caldwell House Museum (Conrad's Castle), then see the interesting displays at Kentucky Derby Museum, and finally contemplate the long history of Churchill Downs. To see more things to do, photos, where to stay, and more tourist information, read our Louisville trip planner . You can drive from Indianapolis to Louisville in 2 hours. Another option is to take a bus. Traveling from Indianapolis in February, expect Louisville to be a bit warmer, temps between 9°C and -1°C. Wrap up your sightseeing by early afternoon on the 20th (Thu) to allow time for the car ride to Columbus. Get ready for a full day of sightseeing on the next day: identify plant and animal life at Conkles Hollow State Nature Preserve, then kick your exploration up a notch at some of the top local zipline courses and adventure parks, and then wander the streets of Easton Town Center. For other places to visit, where to stay, and other tourist information, read Columbus holiday planner. You can drive from Louisville to Columbus in 3.5 hours. Alternatively, you can take a bus; or fly. In February, Columbus is a bit cooler than Louisville - with highs of 5°C and lows of -5°C. Cap off your sightseeing on the 23rd (Sun) early enough to go by car to Charleston. Charleston is the capital and the largest city in the U.S. Kick off your visit on the 23rd (Sun): look for all kinds of wild species at Wallace Hartman Nature Preserve, tour the pleasant surroundings at Little Creek Park, and then try your luck at Mardi Gras Casino. Keep things going the next day: get outside with Appalachian Power Park, sample the fine beverages at Appalachian Distillery, then explore the different monuments and memorials at Spring Hill Cemetery, then admire the striking features of West Virginia State Capitol, and finally appreciate the extensive heritage of Capitol Street. To find ratings, where to stay, and tourist information, refer to the Charleston trip planner. Drive from Columbus to Charleston in 3 hours. Alternatively, you can take a bus. When traveling from Columbus in February, plan for a bit warmer days and about the same nights in Charleston: temperatures range from 9°C by day to -2°C at night. Wrap up your sightseeing on the 24th (Mon) to allow time to travel to Washington DC. 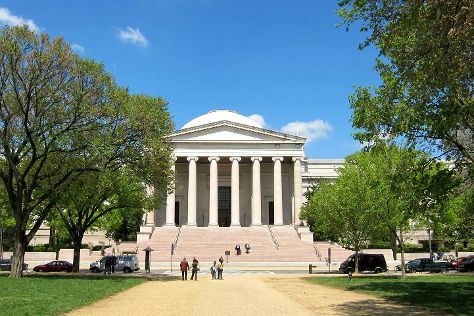 Kick off your visit on the 25th (Tue): explore the world behind art at National Gallery of Art, see the interesting displays at National Air and Space Museum, then stroll the grounds of Arlington National Cemetery, and finally appreciate the history behind Vietnam Veterans Memorial. Get ready for a full day of sightseeing on the 26th (Wed): learn more about the world around you at Smithsonian National Museum of Natural History, get engrossed in the history at United States Holocaust Memorial Museum, then meet the residents at National Zoological Park, and finally take a stroll through Old Town. To see more things to do, other places to visit, traveler tips, and tourist information, use the Washington DC trip itinerary website . Traveling by flight from Charleston to Washington DC takes 2 hours. Alternatively, you can do a combination of flight, bus, and subway; or drive. In February, daily temperatures in Washington DC can reach 10°C, while at night they dip to 0°C. Wrap up your sightseeing on the 26th (Wed) to allow time to take a train to Baltimore. Kick off your visit on the 27th (Thu): wander the streets of Inner Harbor, then take in the history at Fort McHenry National Monument, then try to win big at Horseshoe Casino, and finally take a stroll through Fell's Point. On the 28th (Fri), you'll have a packed day of sightseeing: brush up on your military savvy at U.S. Naval Academy, then let little ones run wild at Centennial Park, and then identify plant and animal life at Loch Raven Reservoir. To see more things to do, traveler tips, and other tourist information, use the Baltimore trip itinerary builder tool . Traveling by train from Washington DC to Baltimore takes an hour. Alternatively, you can drive; or take a bus. In February, plan for daily highs up to 9°C, and evening lows to 0°C. Wrap up your sightseeing on the 28th (Fri) to allow time to take a train to Philadelphia. On the 29th (Sat), explore and take pictures at Independence National Historical Park, admire the masterpieces at Philadelphia Museum of Art, get engrossed in the history at Eastern State Penitentiary, then get a sense of history and politics at Independence Hall, and finally steep yourself in history at Liberty Bell Center. Here are some ideas for day two: admire the masterpieces at Brandywine River Museum of Art, then don't miss a visit to B. Free Franklin Post Office & Museum, then explore the world behind art at Barnes Foundation, and finally browse the eclectic array of goods at Reading Terminal Market. To find where to stay, photos, more things to do, and more tourist information, you can read our Philadelphia online trip itinerary planner . You can take a train from Baltimore to Philadelphia in 1.5 hours. Alternatively, you can drive; or take a bus. In February, daily temperatures in Philadelphia can reach 7°C, while at night they dip to -1°C. 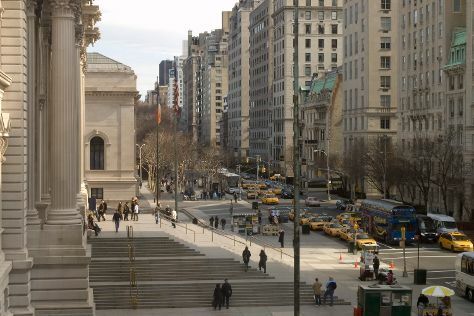 Finish up your sightseeing early on the 1st (Sun) so you can catch the train to New York City. On the 2nd (Mon), take a stroll through Fifth Avenue, settle in for a delightful tour with a horse-drawn carriage tour, then pause for some serene contemplation at St. Patrick's Cathedral, then admire nature's wide array of creatures at Central Park Zoo, and finally make a trip to Times Square. Keep things going the next day: explore the landscape on two wheels at East River Waterfront Esplanade, then don't miss a visit to The Metropolitan Museum of Art, and then explore the landscape on two wheels at Hudson River Greenway. For ratings, photos, maps, and more tourist information, read our New York City trip planner. You can take a train from Philadelphia to New York City in 2 hours. Other options are to drive; or take a bus. In March in New York City, expect temperatures between 11°C during the day and 1°C at night. Wrap up your sightseeing by early afternoon on the 4th (Wed) to allow enough time to travel to Gorham. Gorham is a town in Coos County, New Hampshire, United States. Kick off your visit on the 5th (Thu): glide through natural beauty at Great Glen Trails Outdoor Center, then get to know the fascinating history of Mount Will Walking Trail, and then fly down the slopes at Sunday River Ski Resort. Here are some ideas for day two: fly down the slopes at Bretton Woods, then kick back and relax at Echo Lake Beach, and then look for gifts at Chutters. Start your trip to Gorham by creating a personalized itinerary on Inspirock. Use the Route module to find suitable travel options from New York City to Gorham. Traveling from New York City in March, things will get cooler in Gorham: highs are around -9°C and lows about -19°C. Finish up your sightseeing early on the 6th (Fri) so you can travel to Madison. Madison is a town in Carroll County, New Hampshire, United States. Start off your visit on the 7th (Sat): take a peaceful walk through White Mountain National Forest, then indulge your thirst for a good beer at Tuckerman Brewing Company, and then examine the collection at Remick Country Doctor Museum & Farm. For more things to do, maps, where to stay, and other tourist information, refer to the Madison trip planner . Traveling by car from Gorham to Madison takes an hour. In March, Madison is much warmer than Gorham - with highs of 13°C and lows of 0°C. Finish your sightseeing early on the 7th (Sat) to allow enough time to travel to Boston. Start off your visit on the 8th (Sun): get to know the fascinating history of Freedom Trail, then admire the masterpieces at Museum of Fine Arts, then take a stroll through Newbury Street, and finally browse the different shops at Faneuil Hall Marketplace. Get ready for a full day of sightseeing on the 9th (Mon): take a stroll through North End, then immerse yourself in nature at Walden Pond State Reservation, and then look for gifts at sophia's greek pantry. To see ratings, more things to do, and more tourist information, refer to the Boston trip maker site . Traveling by car from Madison to Boston takes 2.5 hours. While traveling from Madison, expect a bit cooler days and about the same nights in Boston, ranging from highs of 7°C to lows of -1°C. Wrap up your sightseeing on the 9th (Mon) early enough to travel to Acadia National Park. Kick off your visit on the 10th (Tue): delve into the lush surroundings at Indian Point Blagden Preserve, then take an in-depth tour of Somesville Historical Museum and Gardens, then take your sightseeing to a higher altitude at Cadillac Mountain, and finally identify plant and animal life at Sieur de Monts Spring. Get ready for a full day of sightseeing on the next day: look for all kinds of wild species at Acadia's Birds, then appreciate the extensive heritage of Great Meadow Walk, then kick back and relax at Sand Beach, and finally take a memorable drive along Park Loop Road. To see reviews, where to stay, other places to visit, and more tourist information, go to the Acadia National Park trip itinerary planner . Getting from Boston to Acadia National Park by flight takes about 4.5 hours. Other options: do a combination of flight and car; or drive. Plan for slightly colder temperatures traveling from Boston in March, with highs in Acadia National Park at 3°C and lows at -6°C. On the 12th (Thu), wrap the sightseeing up by early afternoon so you can travel to Buffalo. Kick off your visit on the 13th (Fri): take a stroll through Elmwood Village, shop like a local with Walden Galleria Mall, admire the landmark architecture of Frank Lloyd Wright's Darwin D. Martin House Complex, then admire the masterpieces at Burchfield Penney Art Center, and finally brush up on your military savvy at Buffalo & Erie County Naval and Military Park. On your second day here, learn about winemaking at Willow Creek Winery, do a tasting at Liberty Vineyards Winery, then try your luck at Hamburg Gaming, and finally take in the spiritual surroundings of Our Lady of Victory Basilica. To see maps, other places to visit, traveler tips, and more tourist information, refer to the Buffalo day trip planning site . Traveling by flight from Acadia National Park to Buffalo takes 6.5 hours. Alternatively, you can do a combination of car and flight; or drive. March in Buffalo sees daily highs of 4°C and lows of -4°C at night. Wrap up your sightseeing on the 14th (Sat) to allow time to drive to Niagara Falls. On the 15th (Sun), try your luck at Seneca Niagara Casino, then see the interesting displays at Niagara Wax Museum of History, then admire the masterpieces at Castellani Art Museum of Niagara University, and finally admire the sheer force of Niagara Falls. On your second day here, steep yourself in history at Old Fort Niagara, examine the collection at Niagara Power Project Visitors Center, and then revel in the low prices at Fashion Outlets of Niagara Falls, USA. To see ratings, reviews, where to stay, and more tourist information, read our Niagara Falls driving holiday planner. Niagara Falls is just a stone's throw from Buffalo. In March in Niagara Falls, expect temperatures between 4°C during the day and -5°C at night. Finish your sightseeing early on the 16th (Mon) so you can drive back home. On the 17th (Tue), identify plant and animal life at Oakwood Metropark Nature Center, see the interesting displays at The Henry Ford, examine the collection at Greenfield Village, then browse the exhibits of Motown Museum, and finally get a taste of the local shopping with Greektown. Get ready for a full day of sightseeing on the 18th (Wed): buy something for everyone on your list at Great Lakes Crossing Outlets, then hike along West Bloomfield Woods Nature Preserve And Nature Trail, then meet the residents at Detroit Zoo, and finally look for gifts at Polish Art Center. For more things to do, maps, reviews, and more tourist information, you can read our Detroit travel planning website . You can drive from Niagara Falls to Detroit in 4.5 hours. Alternatively, you can fly; or take a train. In March, daily temperatures in Detroit can reach 6°C, while at night they dip to -3°C. Wrap up your sightseeing by early afternoon on the 19th (Thu) to allow time for travel back home. On the next day, admire the masterpieces at The Walters Art Museum, then explore the striking landscape at Devils Den, then steep yourself in history at Eisenhower National Historic Site, and finally take in the history at Gettysburg National Military Park. You can plan Baltimore trip in no time by asking Inspirock to help create your itinerary. Fly from Detroit to Baltimore in 4.5 hours. Alternatively, you can do a combination of flight and train; or drive. Traveling from Detroit in March, things will get a bit warmer in Baltimore: highs are around 13°C and lows about 2°C. On the 22nd (Sun), wrap the sightseeing up by early afternoon so you can travel back home.